Seated Liberty Quarters with Motto and Arrows represent the fifth variety in this series. They were coined at the US Mint in 1873-74. 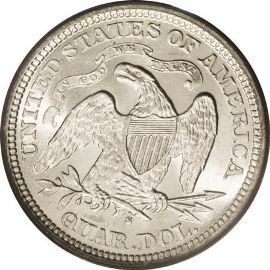 The Mint Act that was passed on February 12, 1873 essentially demonetized silver. It eliminated silver dollar coins as a trade unit, as well as the half dime, two and three cent pieces. The Act provided for a slight increase in the weight of the dime, quarter and half dollar to conform to the "metric" system. adopted again for the coinage of 1873 to 1874. The weight change was so insignificant that it made no difference whether the coins were made on old or new planchets. The obverse of these silver coins depicts Miss Liberty seated on a rock, holding the Union Shield in her right hand and a staff in her left. 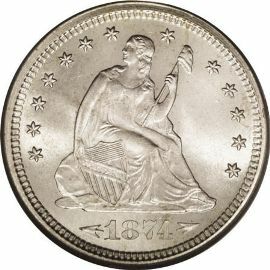 On the coinage of 1873 and 1874, the date is below Miss Liberty and is flanked by opposing arrowheads.